There’s more to it than connecting San Antonio with Austin and Dallas/Fort Worth. Two potential South Texas routes were selected for further study, according to [Rep. Henry] Cuellar. The first would originate in San Antonio and travel south outside of existing transportation corridors to a station near the Laredo-Columbia Solidarity Bridge. That route would then cross on a new railway bridge to join a new rail line which would continue to Monterrey, Mexico. Cuellar said that route would have the potential for high-speed rail service, with trains traveling at speeds of 180 to 220 miles per hour. 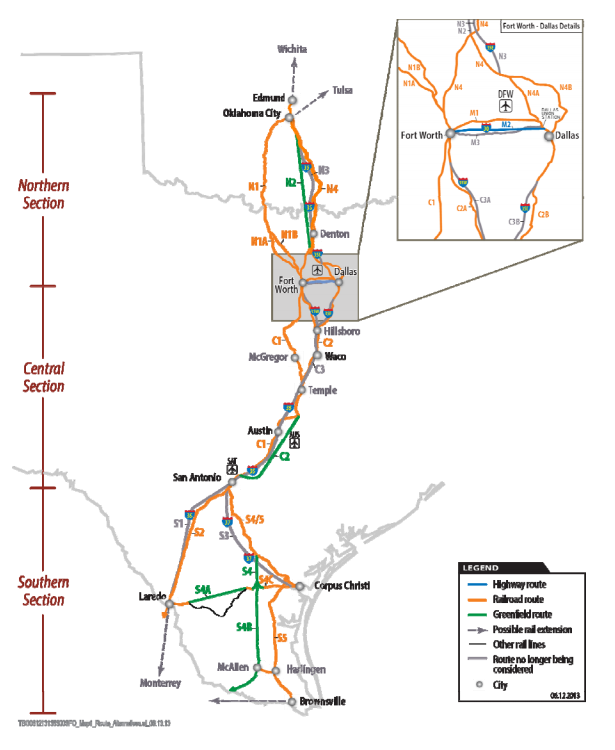 The second route would begin in San Antonio and travel southeast to Alice. At Alice, the route would divide into three legs. The first leg would travel to San Diego, Texas and then to the Laredo area. The second leg would travel south along abandoned railroad tracks to McAllen and east to Harlingen and Brownsville, while the third would travel east along the KCS Railway to Corpus Christi. Once the Tier 1 study is completed, interested developers could conduct a Tier 2 study for preferred routes. That study would provide project-level analyses, detailed design, alignments and cost refinements, Cuellar said. More than 10 million people currently live along the 850-mile corridor under study. That population is expected to increase nearly 40 percent by 2035. See here for the background. You can see the different options in the embedded map. The Monterrey option was a later addition to the project scope due to the high-speed possibility, for which private investment is also in play. I’m very interested in seeing how this goes.